After dipping my toe back in the water last month, I am officially bringing back my monthly fitness goals series. Because boy do I need to get this body back into shape! A year of heavy travel and stressful life decisions apparently takes its toll. And since the approach of setting goals month by month (and holding myself accountable here) worked pretty well last time around, that’s where I’m starting again. I’ve mentioned it in passing, but I’ll be spending most of this month in Hong Kong on an extended work trip. I’m getting more and more excited as it gets closer. I plan to have a regular exercise routine while I’m there, but more importantly, I want to make sure I am getting out and exploring as much as I can. And hiking! Hong Kong has incredible hiking all within easy commute of the downtown areas, and I plan on taking full advantage of the warm temperatures to make it a January full of long walks and the great outdoors. Offset, of course, by dim sum and roast pork but that’s a different conversation. Accordingly, my goal for this month is just about being out there, and steps is how I’m going to measure it. At a minimum, I want to hit 10K every day, and if that means that when I get home from work with 5,000 steps we have to venture out for a twilight walk to find the best dumplings in a new neighborhood? All the better. The only out I get are my two full plane days, and even then, I’ll do my best in the airport hallways. And come February, I’ll be reporting back here about the best hikes and long walks for exploring the city. 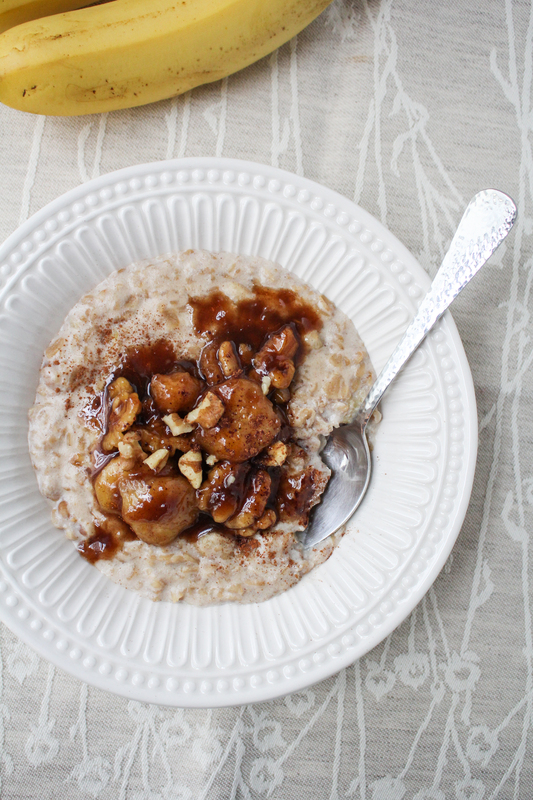 I’ve been making this oatmeal all year, but January seemed like a particularly good time to share it. 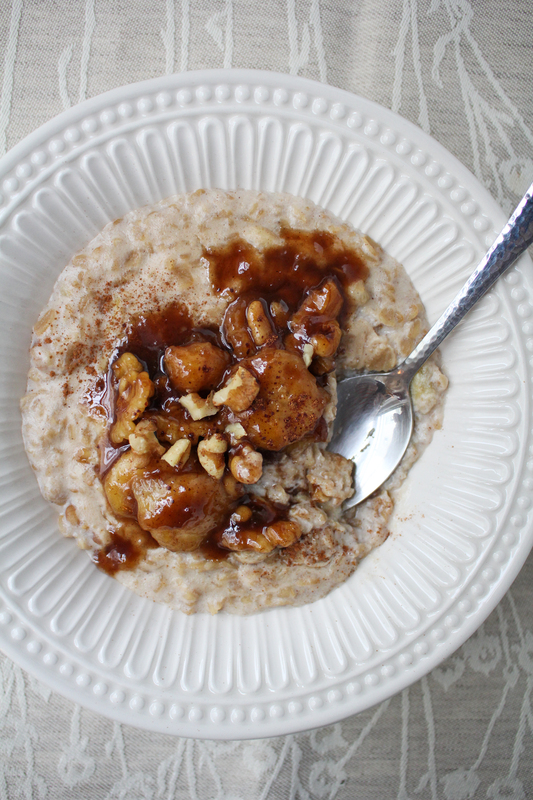 This is super quick to make, and isn’t much of a stretch from a normal bowl of oatmeal – the only difference is that instead of adding brown sugar, banana, and nuts as toppings, you saute them in a bit of butter to start, then cook the oatmeal right on top of them, so you end up with a bowl of creamy oats deeply infused with sweet, buttery, banana-y goodness. 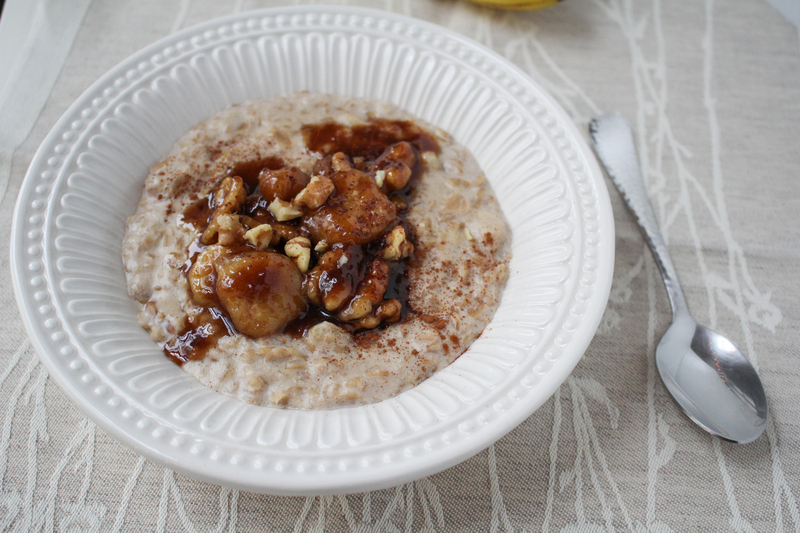 Although I’m calling it bananas foster, I haven’t added any rum – that would definitely take it out of healthy breakfast territory – but I promise you it still tastes like bananas foster should. Only, in oatmeal form. For breakfast. My favorite oatmeal on a cold winter morning. 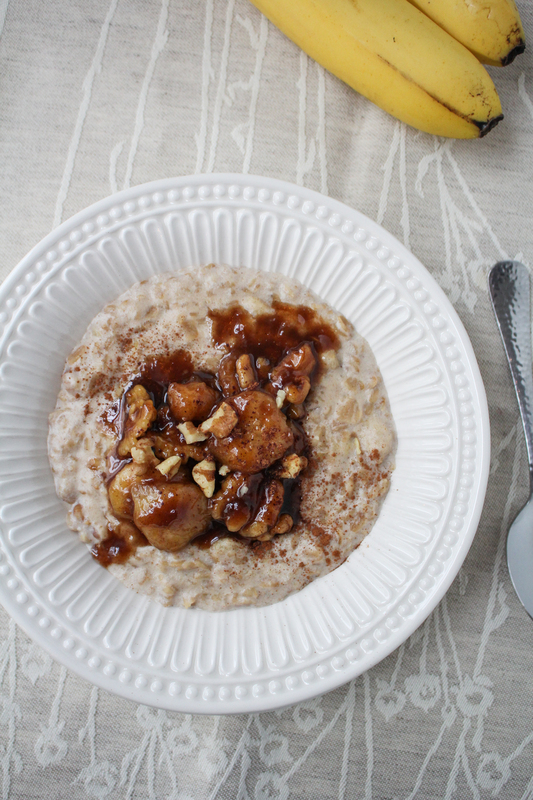 Topped with caramelized bananas, nuts, and cinnamon. In a medium saucepan, melt the butter over medium heat. Add the brown sugar and stir until melted, about 1 minute. Add the pecans and sliced banana and stir to coat in the brown sugar mixture. Cook until bananas are soft and fragrant, about 3-4 minutes, stirring frequently. 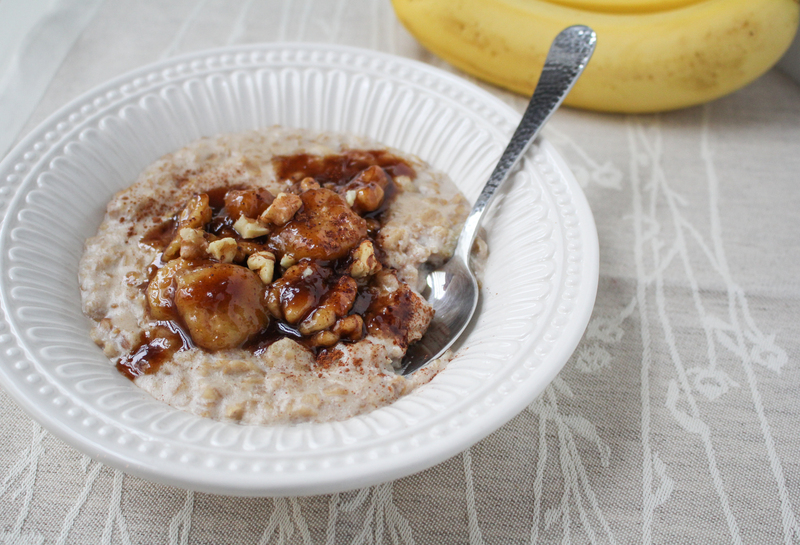 Spoon half of the banana mixture into a bowl for topping your oatmeal. Add the oats and cinnamon to the remaining half of the banana mixture still in the pan. Stir to coat the oats in the sauce. Toast the oats for 1 minute, then add the milk. 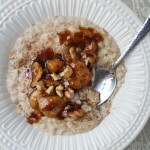 Cook, stirring frequently, until oatmeal is thick and oats are soft, about 5-8 minutes, then remove from the heat. Divide oatmeal between two bowls and top with the reserved banana mixture. Serve immediately. This looks delicious! I love the way you cooked it all together, yum! Good luck with your fitness goals for the year and I hope you have a great time in Hong Kong! Happy 2016! Yummy looking bowl of oatmeal. I would love to see some pictures of the steps involved in creating this dish. All the pictures are of the finished dish. Thanks! Hi ML, thanks for your note! As you might guess from my other posts, taking pictures of the cooking process isn’t really my style here – I’ve tried it, just doesn’t work for me. But I appreciate the feedback. I hope you enjoy the oatmeal if you try it!